SISTERS, Ore. — Central Oregon is home to so many inviting trails it can be downright daunting to determine the best option for a day hike. Criteria usually include level of difficulty, length of time required and scenery. 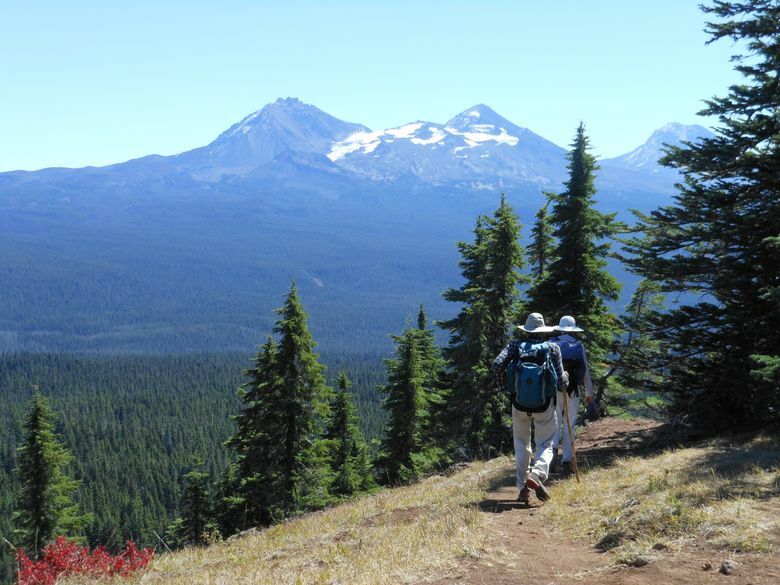 My idea of an ideal hike lies somewhere between an easy stroll along the Deschutes River and climbing 10,358-foot South Sister. Still, so many options exist in the “moderate” 6- to 10-mile range that this hardly narrows down the search. My suggestion is to pick a certain area worthy of exploration and then find a hike that meets your criteria. McKenzie Pass, southwest of Sisters, is one such area. Seemingly endless trails trickle off state Highway 242, offering hikers a much more memorable experience than simply climbing the steps to the top of Dee Wright Observatory at the pass summit. And early fall might be the best time of year to explore the area. Crowds are thinner, the weather is milder and McKenzie Pass typically remains open to vehicles until early November, depending on snow. Some of the more popular hikes nearby include 9.2-mile Black Crater, 6.4-mile Matthieu Lakes Loop, and 10.6-mile Obsidian Falls. After some careful consideration and map research, I settled on the 8-mile Benson Lake/Scott Mountain loop. The trailhead is located just a few miles southwest of Dee Wright Observatory and is about a one-hour drive from Bend. The hike would provide the satisfaction of summiting a peak — though at just 6,116 feet, Scott Mountain pales in comparison with the nearby Three Sisters — and would offer the chance to trek among high mountain lakes, deep subalpine forest, and rocky lava fields within the Mount Washington Wilderness. My journey started from the campground at Scott Lake, and the trail, which was firm and tacky and blanketed by small pine needles, climbed gradually through thick forest. Benson Lake came into view about a half-hour into the walk. Near the lake I could hear the constant humming of insects — the numerous small lakes in the vicinity make it a haven for mosquitoes, but they are less noticeable in the fall and luckily I remembered to layer on the bug spray before leaving the trailhead. Eventually I arrived at a junction where a left turn would lead to Tenas Lakes, just a tenth of a mile down the trail. I arrived at the biggest of the lakes, a turquoise body of water that reminded me of Devils Lake off Cascade Lakes Highway. Several hikers were rounding the rocky shoreline of the lake as the surrounding trees were reflected perfectly in the calm water. After heading back to the main trail, the path soon began to climb steeply up Scott Mountain. I followed the switchbacks and soon Mount Washington, Three Fingered Jack and Mount Jefferson popped into view through the trees to the northeast. After several more switchbacks, the trail becoming increasingly steep, I finally approached the summit of Scott Mountain. Long yellow grass covered much of the summit as the trees thinned out, making room for sweeping, unobstructed views of the Three Sisters just a few miles to the southeast. Receding glaciers clung desperately to North Sister and Middle Sister, and a dusting of early September snow sprinkled the tops of all three peaks. Snowless Mount Washington towered over the vast lava rock field to the northeast. On the clear, cloudless day, even Mount Hood was visible to the north, just beyond the shoulder of Mount Jefferson. While views of Cascade peaks abound on many hikes in Central Oregon, one aspect that sets Scott Mountain apart is its ample vistas of the rugged, green hills of the western side of the Cascades. The nearly 360-degree panorama atop Scott Mountain revealed the wide variety of terrain in Oregon, from the craggy, rocky peaks of the Cascades to the rolling green slopes of the Willamette Valley. After spending 20 minutes or so on the summit, I descended the trail and then came to a junction with Trail No. 4345. The trail would loop me back clockwise to Scott Lake, where I had started the hike. On my way back I passed Hand Lake, or at least where Hand Lake was supposed to be but on this day appeared as only a dry lake bed of dirt and grass. The trail skirted the edge of the lava field as the Three Sisters came back into view. Finally, four hours after beginning, I made it back to the trailhead. The 8-mile trip offered a bit of everything — lakes, peaks, lava rock — and was just difficult enough to make me somewhat exhausted by the end. The Scott Mountain route met all of my criteria for the perfect day hike in Central Oregon.